As far as the Australian horse racing calendar is concerned there are only two seasons – spring and autumn, and although the NSW Championships were only inaugurated in 2014, they are already elevating the Sydney autumn carnival into the same stratosphere as Melbourne’s spring. Held at the prestigious Royal Randwick racecourse, The Championships is a ‘crown jewel’ of sorts for the Sydney Autumn Racing Carnival. The Championships act as a grand final across a number of different weights, ages and sexes to determine who the best horses in the country truly are. There is over $20 million in prize money on offer across a plethora of group races (including four group 1 races on each of the two days) which draws the best racehorses from around Australia to compete in top quality races against the best the international scene has to offer. The Championships are held on the first and second Saturdays in April of every year at Royal Randwick racecourse in Sydney. Tickets for both days become available for purchase from the Australian Turf Club website for the first day on April 1 and for the second day on April 8 – or tickets can be purchased at the gate. Prices range from $20 for a general admission concession ticket ($40 for an adult GA) all the way up to $165 for a member’s guest ticket. The Championships are spread across two race days with eight group 1 races in total, with four on each day. The group 1 racing is regarded as some of the best in the world. First held in 1866, the Group 1 Doncaster Mile is billed as Australia’s premiere mile race and the world’s most lucrative miler in the world. Raced over the 1600m for three-year-olds and older, the race is worth $3 million and has a winner’s board that reads like a hall of fame honour roll. In 2016 superstar mare Winx launched her spectacular season in stylish fashion, hammering the field to record a comfortable win. In 2013-14 Sacred Falls became the first horse since 1995 to go back-to-back in the mile, while the people’s champion Sunline forged its career in the race, winning in both 1999 and 2002. Although the 2017 running of the Group 1 TJ Smith Stakes will only be 20th instalment of the race, it has quickly solidified its reputation as one of Australia’s best sprint races. Over 1200m for two-year-olds and upwards, the TJ Smith Stakes is worth $2.5 million and claimed its group 1 status back in 2005. Some of Australia’s favourite sprinters have taken out the race in a veritable whose who of the sprinting fraternity. ‘The Thunder From Down Under’ Chautauqua went back-to-back in the race for the first time in TJ Smith Stakes history last year after storming home from last to win at the line not once but twice. Wonder mare Black Caviar became the first horse to win the race twice after torching the field in 2011 and 2013 while Aussie racing darling Takeover Target’s win in 2009 is arguably the most well remembered running of the race. Billed as Australia’s premiere staying race for three-year-olds at set weights, the Group 1 Australian Derby is raced over 2400m and is worth $2 million. First raced in 1861, the Australian Derby has been an autumn showpiece event in Sydney since 1979. Some of the industry’s best ever names have saluted in the Australian Derby. Arguably Australia and New Zealand’s best ever race horse Phar Lap won the race in 1929, West Australian Kingston Town saluted back in 1980 while Mongolian Kahn’s win in 2015 ensured it would go down as one of the greats after being the first horse in 29 years to complete the New Zealand – Australian Derby double. Superstar Australian horse Octagonal set a blistering 2:28.41 race record in the Australian Derby back in 1996. Inglis’ Sires: A race steeped in history, the 2017 $1 million Inglis’ Sires will be the 150th incarnation of the race. Ran over the 1400m for two-year-olds at set weights, the Inglis’ Sires is the second leg in Australian two-year-old Triple Crown; wedged in between the Golden Slipper and the Champagne Stakes. In 2016 Yankee Rose blitzed the field as a short-priced favourite to salute in the Sires, Australian superstar Octagonal won in 1995 and one of Australia’s most famous horses Ajax also has an Inglis’ Sires victory to its name. Arguably the crowning race of the Championships, the Queen Elizabeth Stakes is worth $4 million, making it Australia’s richest weight-for-age race in Australia and the most lucrative event on the Sydney autumn calendar. Raced over 2000m for three-year-olds and older, the Queen Elizabeth Stakes was first contested in 1851 (over 4800m), and since the increase in prize money and the shortening of the distance it has attracted the best and brightest from around the globe. Star on the rise Lucia Valentina won the race in 2016, retired superstar Lonhro saluted in 2003 while the magnificent Might And Power claimed the 1998 running of the race to win its fifth group 1 race of that year. While it does not carry the prestige and allure of that other big Cup race, the Sydney Cup is a major event in its own right. First run and won in 1862, the Sydney Cup did not gain its group 1 status until 1980, a race which was taken out by Western Australian star Kingston Town. The Sydney Cup is worth $2 million that is a handicap event for horses aged three years or older over 3200m and has seen some of the world’s best grace the Randwick track in search of glory. Makybe Diva won the race in 2004 – completing a cup double after it went on to win the Melbourne Cup later that year – Tie The Knot went back-to-back in 1998-99 while Apollo Eleven (1973) and Just A Dancer (1991) both hold the record for the fastest ever recorded time in the Cup at three minutes and 19 seconds. The Australian Oaks may be one of the lesser known group 1 races of the Championships – if there ever can be one – but it is one of the true staying races exclusively for the fillies that the world has. Worth $1 million, the Australian Oaks pits the best three-year-old fillies in the world against each other in an endurance test over the 2400m. The race was first run back in 1885. Previous winners of the race have been stars Rising Romance (2014) and Royal Descent (2013) but incredibly the race is one of Australia’s only group 1 events that has a dead heat to its name after Tamarisk and Crossfire could not be split on the line back in 1886. The Coolmore Legacy Stakes – or the Queen Of The Turf Stakes as many would know it – is a race for fillies and mares aged three-years-old and over across the 1600m at Royal Randwick. 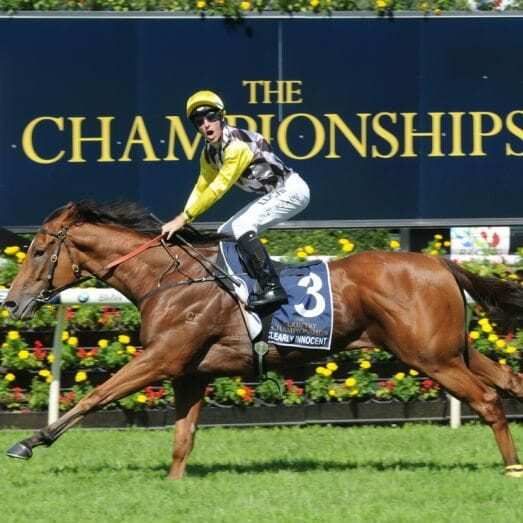 Only obtaining its group 1 status back in 2005, the Coolmore Legacy Stakes also was not run at Randwick until the inaugural Championships when the Australian Turf Club snatched the race from Rosehill to order to bolster the second day of their new concept. Now valued at $1 million, the race routinely pits Australia’s best female horses against each other. In 2016 Azkadellia got a fantastic ride from Damian Oliver along the rails to win, while the previous year’s winner Amanpour won at double figure odds after leading the entire race and kicking away in the final stages. More Joyous remains the only horse in the race’s history to have won the race more than once after going back-to-back in 2011-12. The Group 2 Arrowfield Sprint is a $600,000 race over the 1200m for horses aged three years and older. Originally known as the Keith Mackay Stakes, a boost in prize money to $600,000 ensured the Group 2 Percy Sykes Stakes over the 1200m for two-year-old fillies was moved into the Championships. Coming together in 2014, the Championships were the brain child of the Australian Turf Club (ATC) who were looking to set up a ‘Grand Final’ type scenario in Australian horse racing which would determine who the best horse in any particular category was at that given moment. The ATC then decided to take all the best races from the Sydney autumn carnival and run them across two days at Royal Randwick racecourse – a stroke of absolute genius which keeps eyeballs glued to the harbour city. A total prize pool of $20.2 million across the two days of action, the best part of the Championships is that gives horses that do not have the traditional means of getting a crack on the big stage at Randiwck the resources to do so via the qualifying stages, which allows horses who have won particular races at smaller country tracks the ability to step up and strut their stuff on the Royal Randwick course. What are the burning questions ahead of the 2017 Championships? There is two big points of contention heading into the fourth running of the Championships this year: the status of the carnival itself, and the potential unavailability of superstar jockey James McDonald. We take our best shot at answering those questions and several others. Will Winx race during The Championships? Without question the potential reappearance of dual Cox Plate and 2016 Doncaster Mile winner Winx will be the main draw card of the 2017 Championships. Will the mighty mare compete in the Doncaster Mile again and go back-to-back like she did in the Cox, or do connections have another race in mind for the world’s best turf horse? Either way, to see the superstar of the track take to Royal Randwick again in 2017 is sure to draw thousands of extra fans through the gates to see the special one go around one more time. Will James McDonald be available to ride for Godolphin? This is the hottest question heading into 2017. Godolphin jockey James McDonald elected to stand down from the stable until the issue of whether or not he was party to a bet placed on one of his runners from earlier in the season. McDonald had been in sparkling form throughout the season until his self-imposed exile, but the stable has no shortages of quality jockeys to choose from if McDonald is unable to successfully plead his case. As of late 2016 there is no indication of when McDonald’s case will be heard, what the likely outcome will be but a guilty verdict carries a mandatory two-year disqualification, but that could be mitigated by co-operation during the inquiry. Godolphin for now is standing by the Kiwi, so if he is cleared expect him in the saddle come April. Is the Championship the biggest carnival in Australia? The age-old debate between NSW and Victoria rages on, this time in horse racing terms. In reality, other than having a much larger purse, Australian racing will always be synonymous internationally with the spring racing carnival. Will that change in the coming years? We are only entering the fourth year of the Championships in 2017 but we have already had worldwide training stars like Charlie Appleby and stables like Godolphin targeting this carnival as something they would love to conquer so we only see the festival growing exponentially. As with most things in the NSW/Victoria rivalry neither side will ever concede defeat. So we can just sit back and enjoy the quality racing both carnivals have on offer. In the end, the sport is the real winner.